Click on the questions below to read the answers. What is the ESTHER Alliance? The ESTHER Alliance is a network of European countries working in synergy to tackle HIV/AIDS and major diseases and to improve women, newborn and children’s health. It involves twinning between European hospitals and institutions in developing countries to build capacity to improve health care services. It contributes to the implementation of its member states’ policies for health sector development aid. Why did Ireland join the ESTHER Alliance? In 2010 the HSE and Irish Aid signed a Memorandum of Understanding, agreeing to collaborate in support of health needs in less developed countries. A key strategy of the collaboration is to promote institutional partnerships, thereby enabling health staff to contribute to other countries while still working in Ireland. The benefits of being a Member of this Alliance include a sharing of experiences and lessons across initiatives; coordination of the different partnerships currently working and/or under development; problems solving with peers; opportunity to press for and encourage good practice; and development of joint initiatives within Ireland and with other countries. What is the aim of ESTHER Ireland? The ESTHER Ireland programme aims to establish sustainable institutional partnerships between health institutions in Ireland and similar institutions in the developing world. ESTHER Ireland will contribute to Irish Aid’s objectives for health and development. It is based on ‘a spirit of partnership and equality’ which is a fundamental principle of Ireland’s development cooperation policy. ESTHER Ireland particularly aims to strengthen health systems and particularly human resources so as to tackle HIV and other major diseases and to improve women, children and newborn health in priority countries in Africa and Asia. The programme will use the twinning model to foster effective north-south and south-south partnerships that can build capacity of the health workforce and health institutions. It will engage with the other European Members to develop a strong network of partnerships and become a powerful force for development and health improvement in the coming years. How will Ireland’s ESTHER Programme be implemented? ESTHER Ireland will be implemented under the MOU between the HSE and Irish Aid. It will be directed and overseen by a steering group with membership from the HSE, Irish Aid, Irish hospitals and the Irish Forum for Global Health. The Irish Forum for Global Health is serving as secretariat for ESTHER Ireland. Participation of HSE hospitals and other health institutions will be facilitated by the HSE Global Health Programme. Individuals interested in finding out how their institution can become an ESTHER partner are invited to contact the Programme (info@esther.ie or globalhealth@hse.ie). Guidance will be provided on how to develop an institutional partnership. Any partnership fulfilling the ESTHER principles in the Charter for Quality of Partnerships can apply to become an ESTHER Partnership. What is a ‘health partnership’? A health partnership is a collaborative relationship between two or more health institutions based on trust, equality, and mutual understanding for the achievement of a specified goal. Partnerships involve risks as well benefits, making shared accountability critical. (Based on definition from WHO African Partnerships for Patient Safety). What are the criteria to become an ESTHER partnership? To become an ESTHER partnership, institutions need to adhere to the principles of quality set out in the ESTHER Charter for Quality of Partnerships. This is to ensure that partner institutions follow international best practice in the way they work together. What types of institutions can apply to become ESTHER partners? I am already involved in a project with a developing country institution. What are the benefits of joining ESTHER? There are several potential benefits for your institution from becoming an ESTHER partner. The Programme will provide guidance on how to develop high quality partnerships and projects. There will be opportunities to learn from and share experiences and lessons with other initiatives in Ireland. There is also the potential to undertake joint projects with other Irish and European institutions. Being an ESTHER Ireland partner will give recognition to your partnership which is likely to help with funding applications to Irish Aid and other donors. Can an individual become an ESTHER partner? No. The philosophy of the ESTHER Alliance is that projects and initiatives based on individual linkages are more effective and sustainable if the relationship is at institutional level. ESTHER Ireland will encourage individuals to seek commitment from the management of their institution so that needs of the partner institution can be addressed through a holistic approach. Can health personnel work overseas as part of an ESTHER partnership? Yes. Typically visits to partner institutions are just for days or weeks as this is what is feasible and practical for personnel working full time in an Irish institution. However in some situations there may be a longer term role for an Irish person, e.g. establishing or implementing a training programme, research project or new service. Getting leave to go overseas is subject to the personnel policies and approval processes of the relevant institution. What activities can be included in ESTHER projects? An ESTHER project may address one or more of a broad range of activities. It is essential that the project addresses a priority health need in the partner institution and is not driven just by the interests of the Irish institution. The ESTHER Alliance is particularly interested in addressing the Millennium Development Goals (MDG) and supports projects in the areas of maternal and child health (MDG 4 & 5) and HIV/AIDS, TB & malaria (MDG 6). While there will be a focus on a particular aspect of health or health care, capacity building activities should be part of any project. This is about strengthening the institutions personnel and systems so that it can provide better health care in a sustainable way. ESTHER Ireland is particularly keen to strengthen the health workforce and encourages training and education programmes and other measures to improve the performance of personnel. Can partner institutions be from any developing country? Yes. ESTHER Ireland is aligned with the Government aid programme (Irish Aid) and most partnerships will be with African institutions. However Irish institutions may develop links with developing hospitals in other regions. Is there funding available for ESTHER projects? The ESTHER programme does not have funds to support projects at this stage. Partnerships will need to raise funds themselves. 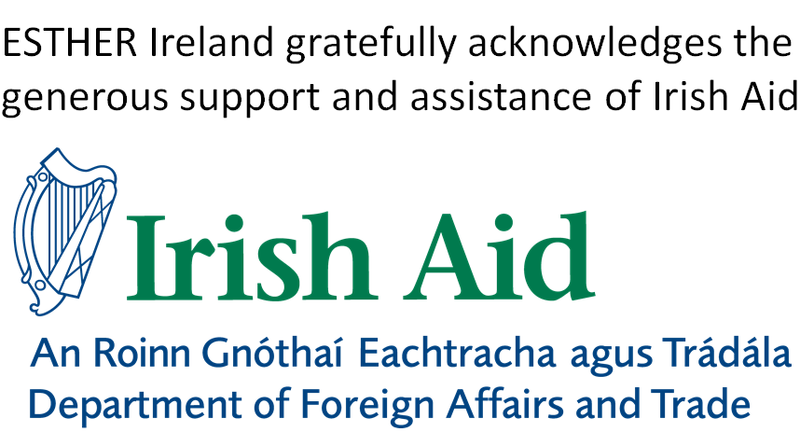 It is hoped that being an ESTHER Ireland partner will assist institutions in funding applications to donors like Irish Aid, as it is a mark of quality. ESTHER Ireland will be exploring possible funding sources for the future, including from Irish Aid and through the ESTHER Alliance at European level. I am interested in developing a link with a developing country. How do I start? Who do I contact? You may be thinking about a partnership because of an existing personal connection in a developing country or you may feel you have a specific skill or capacity to offer. The origins of partnerships are varied and we welcome you to discuss this with us. Contact ESTHER Ireland at info@esther.ie. If you work in the public health service you can alternatively contact the HSE Global Health Programme at globalhealth@hse.ie. Someone will be happy to speak with you and provide information and guidance. A document on health partnerships for Irish institutions and other Information will be available on the ESTHER Ireland website (www.esther.ie). If you have any more questions not listed above please contact us here.